An aerial shot of the Port of Tillamook Bay's new Warehouse Business Park. 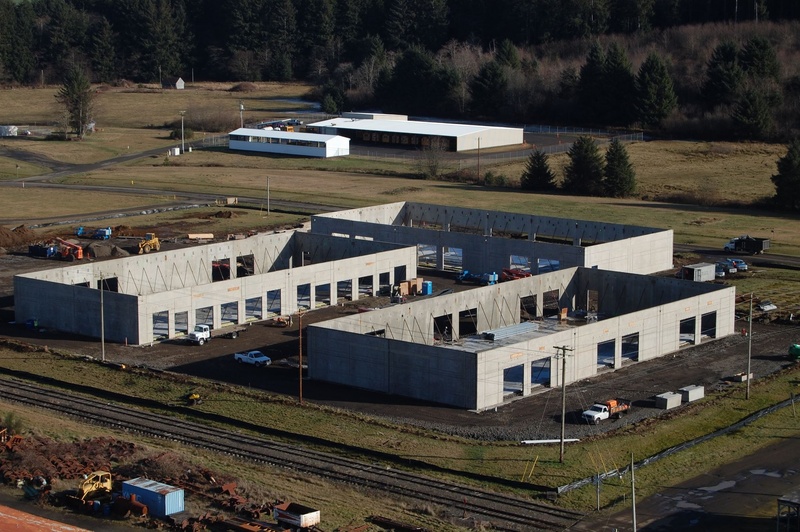 TILLAMOOK, Ore. – The Port of Tillamook Bay is offering flexible space suitable for distributors, general contractors, manufacturers and others for lease at its new Warehouse Business Park. As part of recent improvements to its 1,600-acre industrial park, the Port commissioned construction of three 18,000-square-foot flexible office/warehouse/industrial buildings equipped with loading docks. 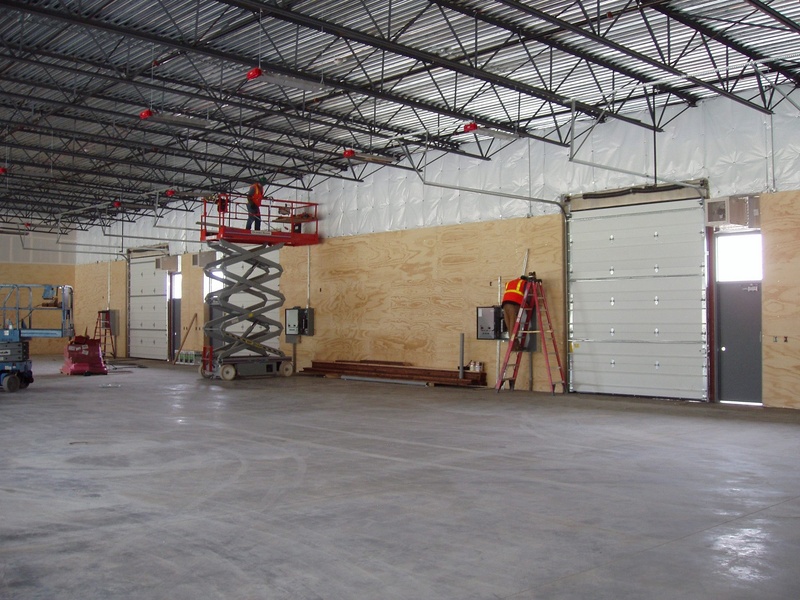 Each building features ground-level panel truck access through coiling doors, while one offers a 4-foot-high loading dock for larger truck receiving. Skanska USA is general contractor for the project, which is scheduled for completion at the end of May. The Port is making large-scale improvements, including construction of the Warehouse Business Park, to its facilities, the former World War II era Naval Air Station Tillamook, located just south of the City of Tillamook, off U.S. Highway 101. Other upgrades include renovation of the former Navy Officers Mess Hall, which involved converting it into a conference space and offices. Work on the inside of one of the flexible warehouse spaces continued in late March. Tillamook is conveniently close to Portland, Salem, Newport and Astoria. The city boasts a new community college building and campus, a countywide library system, a full-service hospital and a number of medical clinics, a small (roughly 2,000 students and six schools) school district, public transportation, an economic development council, one of the more popular county fairs in Oregon and thriving dairy, timber, fishing and tourist industries. It is an ideal location for those who enjoy fishing, clamming, crabbing, water sports, beaches, hiking, hunting and other outdoor recreation. The Industrial Park is served by an advanced telecommunications network and includes an airport, rail line and a variety of tenants ranging from a lumber mill to a commercial high-altitude balloon flight facility. New and expanding non-retail tenants are eligible for a 3-year property tax exemption (inquire for details). Leases are competitively priced and can include improvements to suit individual tenant needs. For more information, contact James Peak at (503) 812-6192, (503) 842-2413, extension 121 or jpeak@potb.org. Posted by rockyintertidalcocreative on March 25, 2012 in Uncategorized.